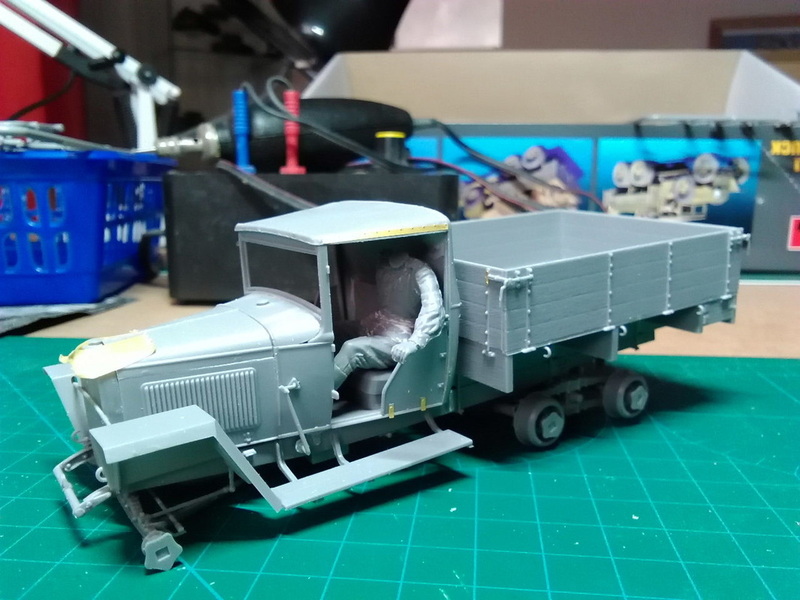 Being built as part of a Facebook Group Build where modellers from all over the world (mostly here!) 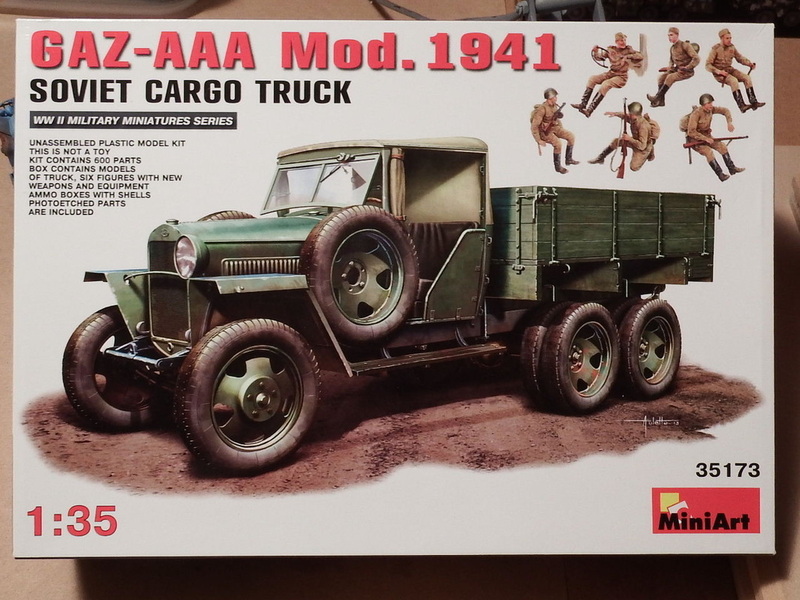 build a vehicle from the GAZ Family of Trucks. 1. 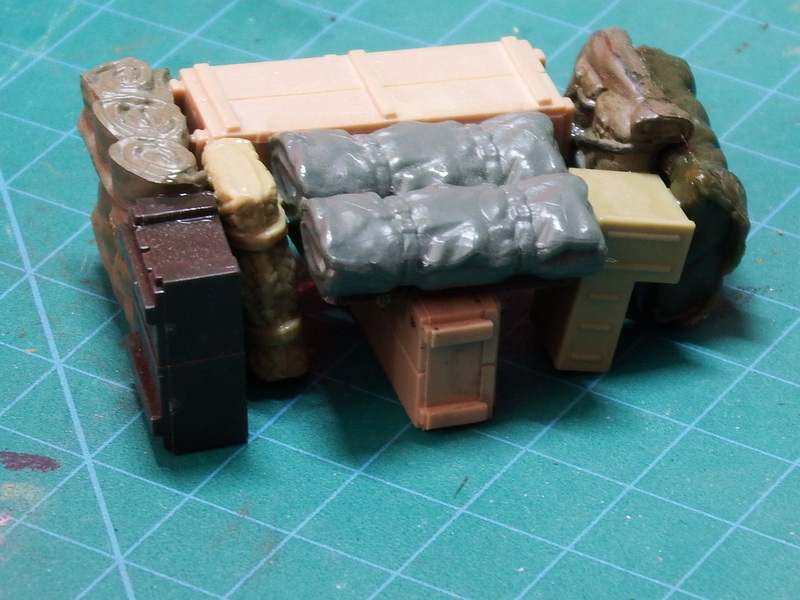 I chose this version as it also comes with 7 figures and a selection of ammunition and boxes. 2. 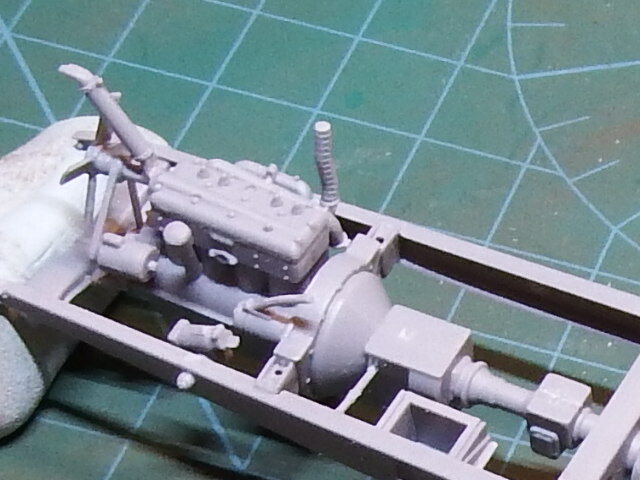 We start with a very detailed engine. Now then! 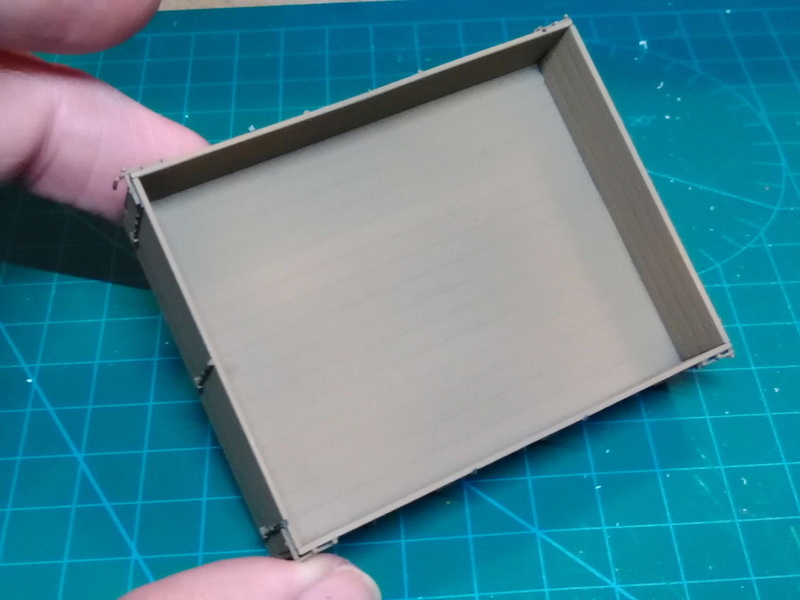 MiniArt plastic is a bit 'softer' than your usual manufacturers so careful with your glues. 4. 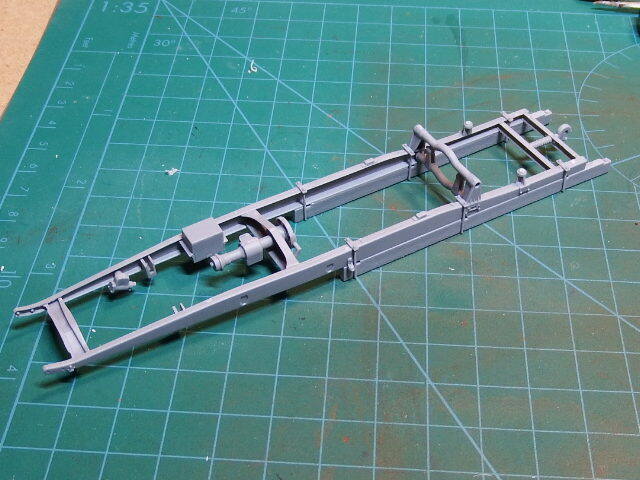 The chassis is next and you do need to ensure a true alignment and bracing the framework. 5. 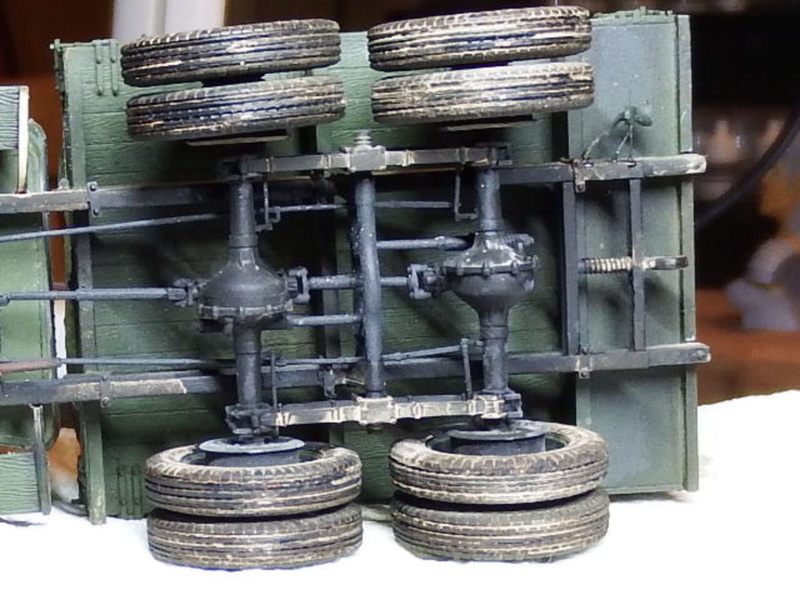 Rear Axles, 2 of course and both the same but you do fit them as opposites. 6. 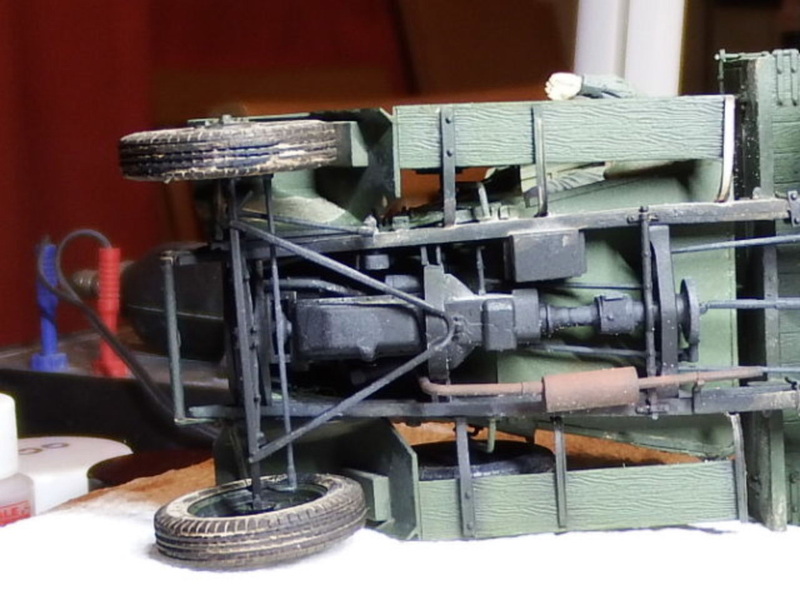 The Engine and Rear Axles have now been attached which was an 'interesting' exercise, 2 or 3 pairs of hands would help here! 9. 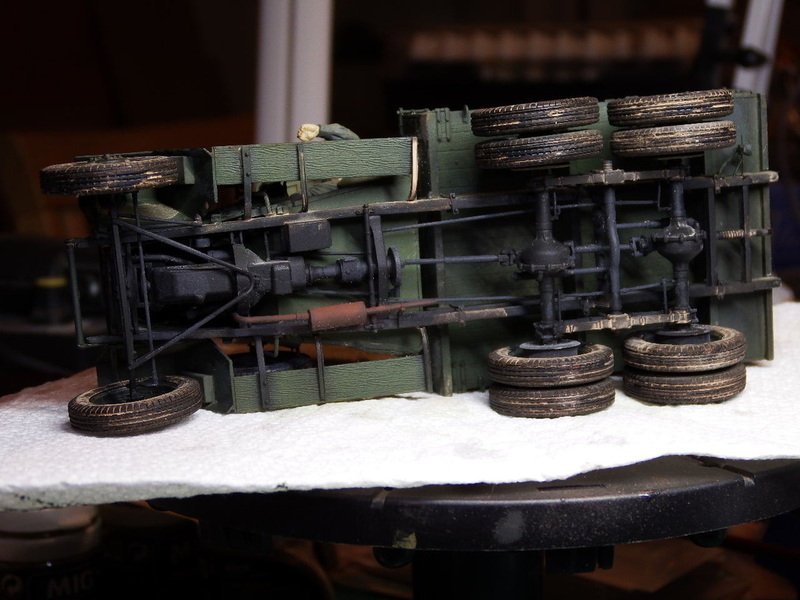 The totally scary underside with front axle and all connector rods installed. 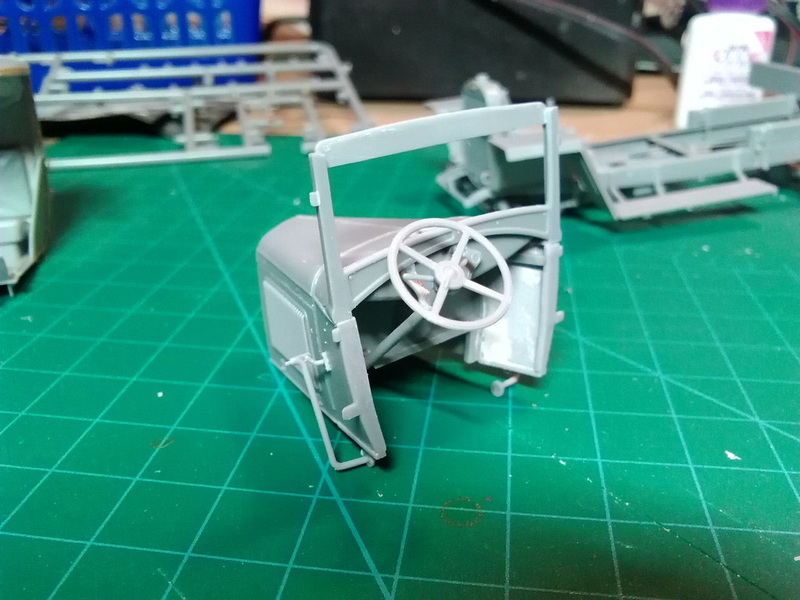 NB: At this point I should say that, the parts for the suspension are extremely finely moulded and whilst they look fabulous on the sprue. 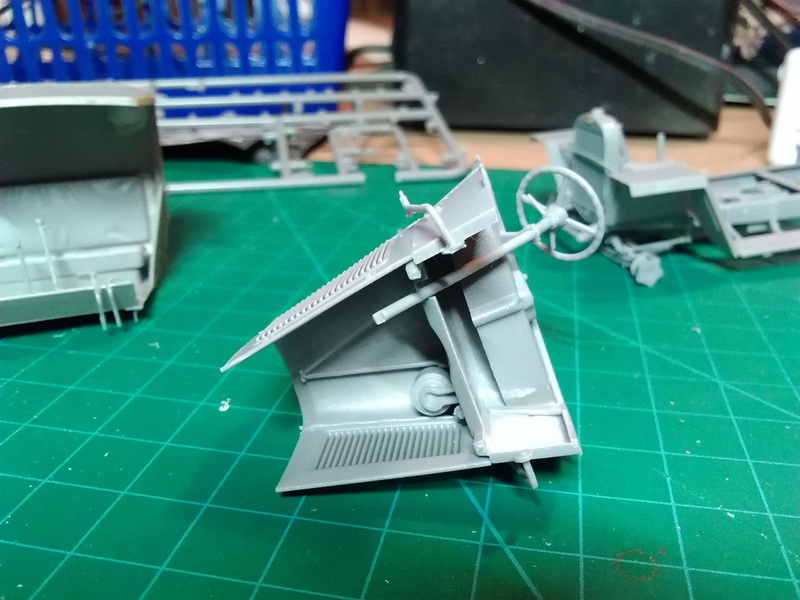 You may however find that some have snapped/snap during installation or, during removal from the sprue - this is not the end of the world however - you could soldier on and build the kit using these parts as I did or, choose to replace the parts with plastic rod/stretched sprue. 10. 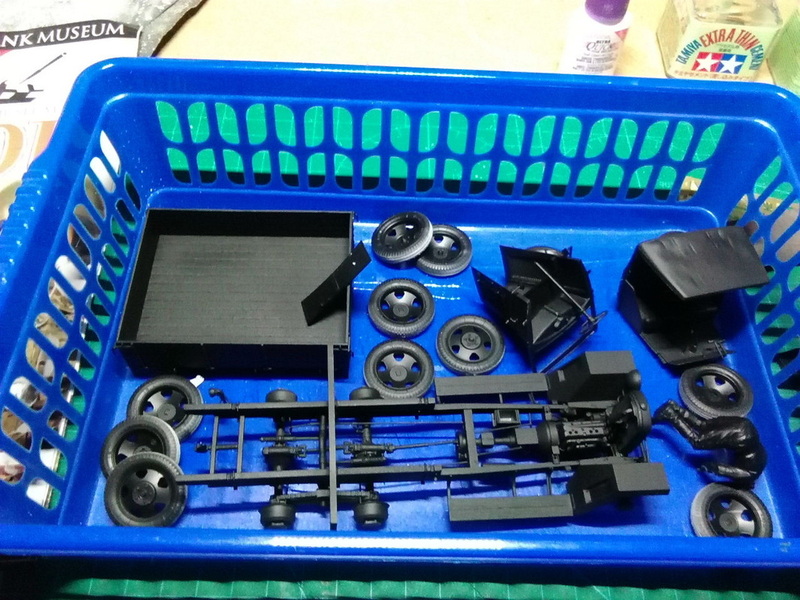 Strangely MiniArt have chosen to have a laminated wheel construction of 7 parts + the centre hub. 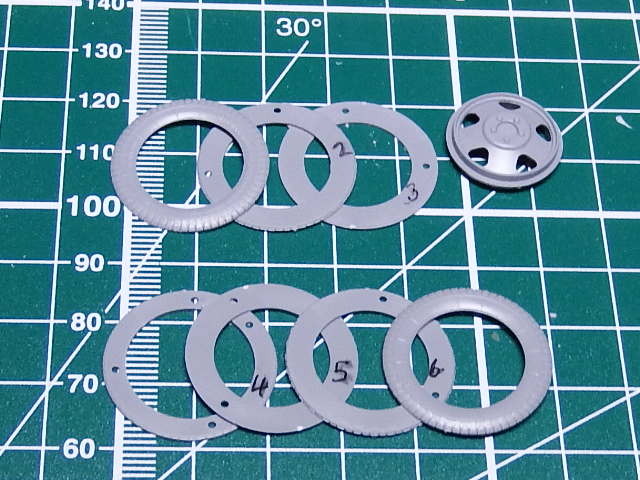 I have numbered each part (you'll figure out why later). 11. 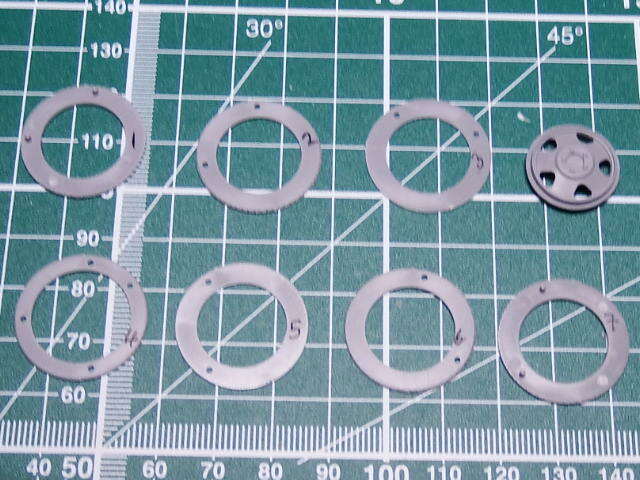 Each Wheel, and there are 12 of them, needs to assembled in sequence as shown above. 12. With part 1-3 on the left and 4-7 on the right we're ready for the final part. 14. 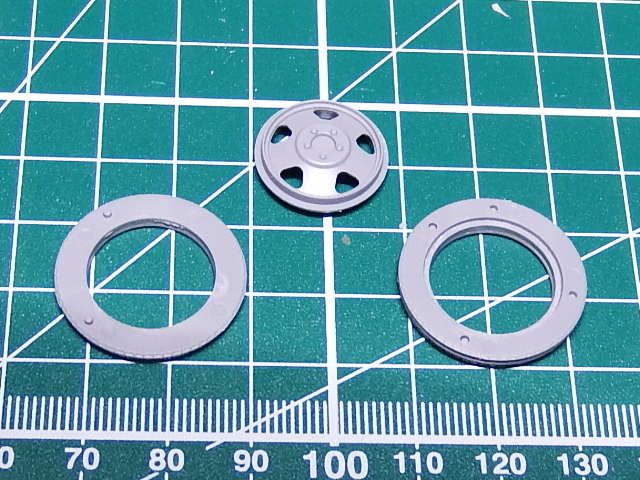 After which you attache the smaller assembly (parts 1-3) to complete the wheel as seen here. 15. 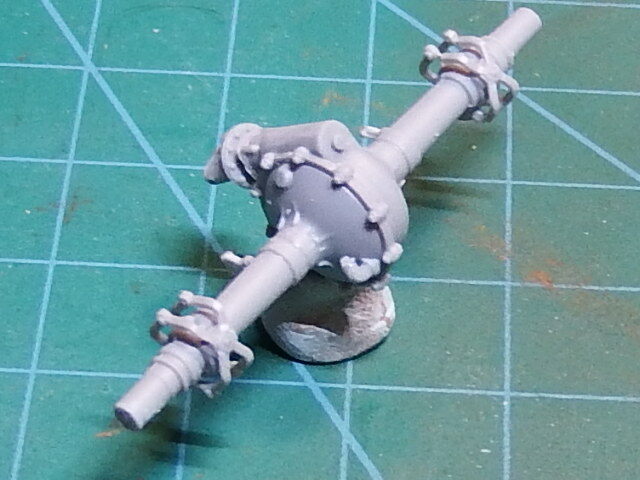 Here's one that went wrong when I spilt my glue over the unassembled parts. 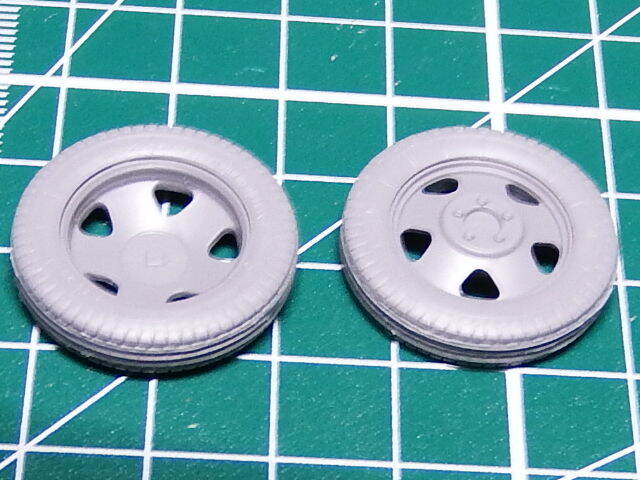 Fortunately this will be an inside rear wheel. 16. 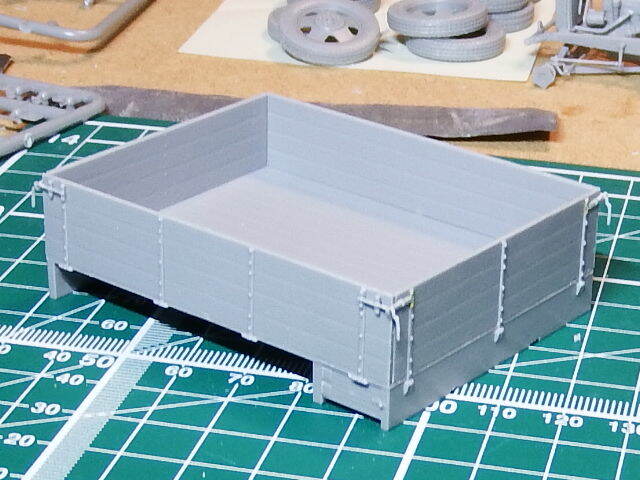 The Cargo Deck. 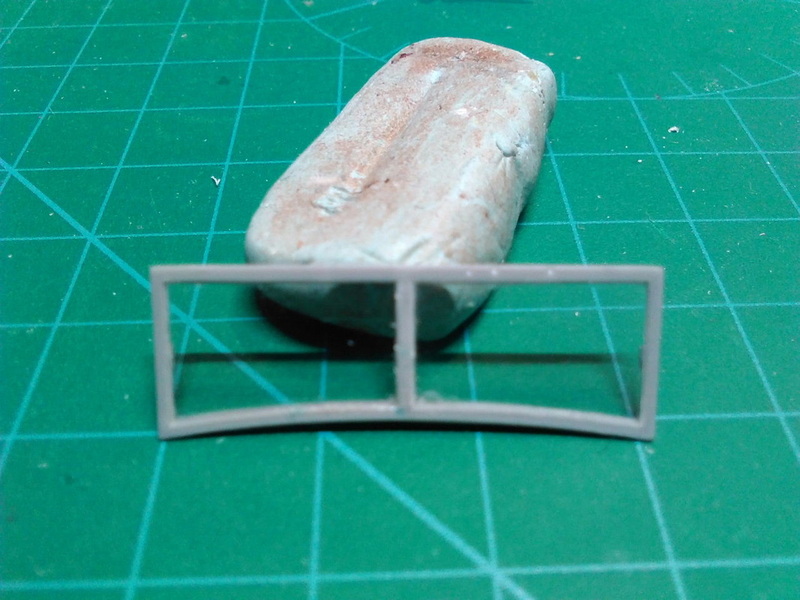 Very simple construction but you should ensure that it is square and true. 17. 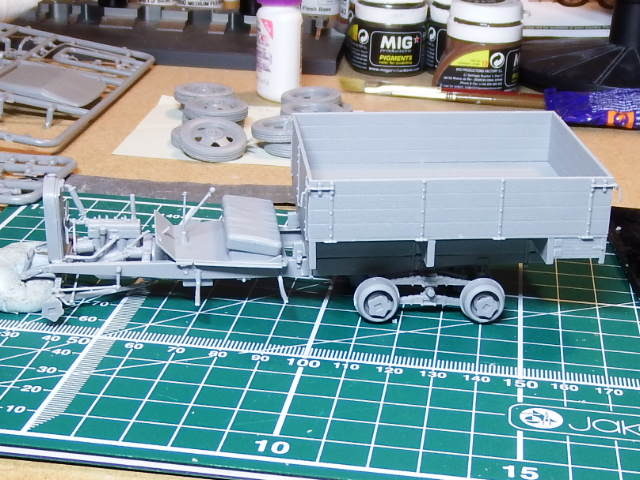 Test fitting the Cargo Deck to the Chassis and, it fits! A little tweaking but nothing drastic. 18. The combination looks good and the full detail is starting to come through on this kit. 20. 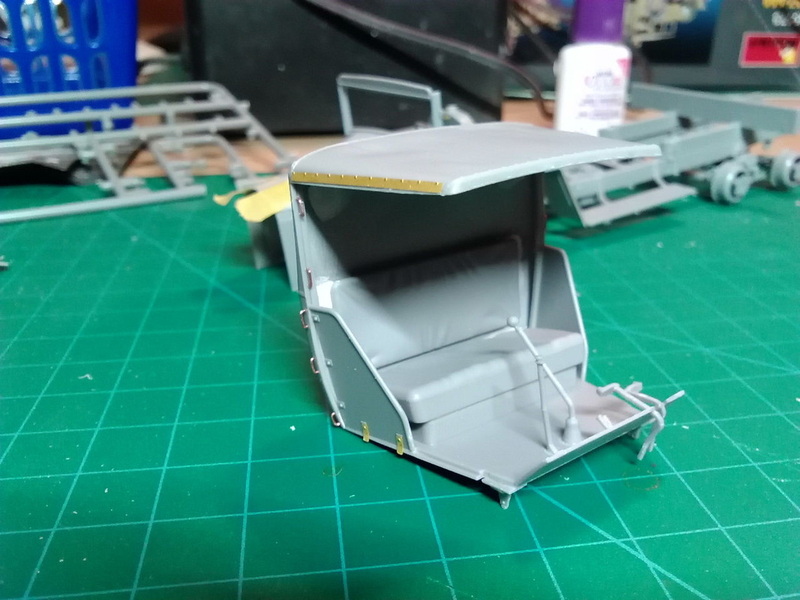 Drivers Seat and Cab area. 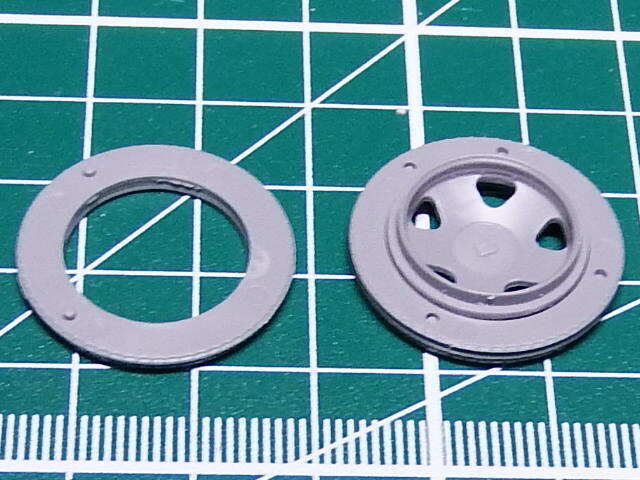 The PE Tie-down handles have been replaced with fine gauge wire. 21. 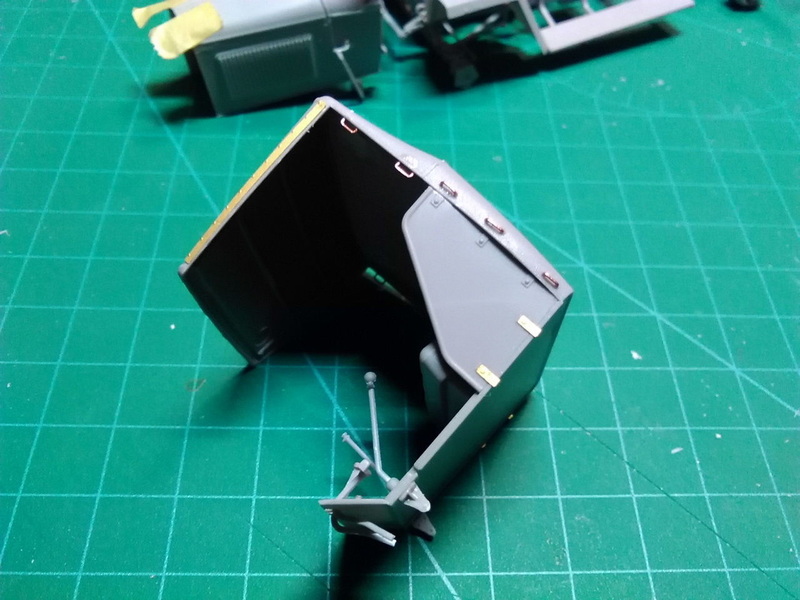 PE is also present on the canvas canopy and as brackets for the side panels. 23. 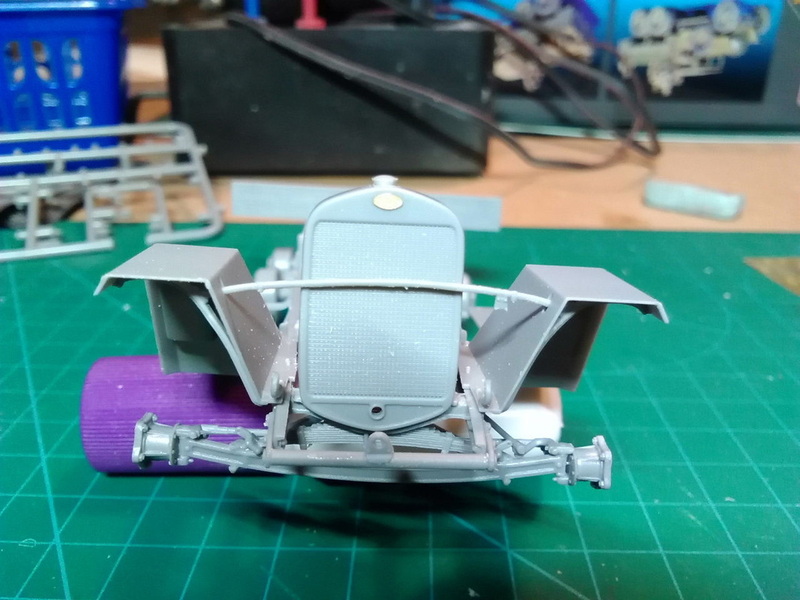 The front with Radiator, Fender brackets and suspension. 25. 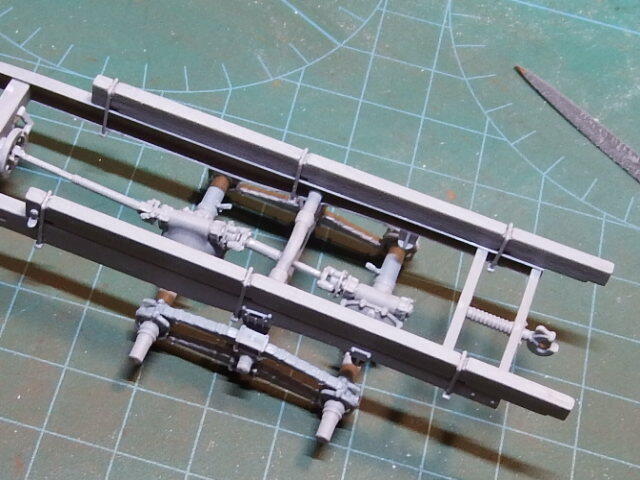 Final test-fit of the sub-assemblies. 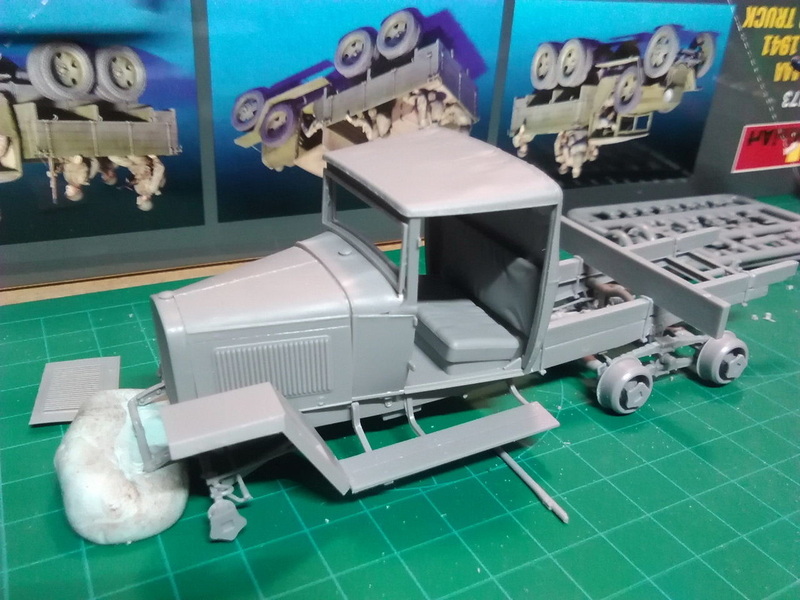 First, the Cab and bonnet. 26. 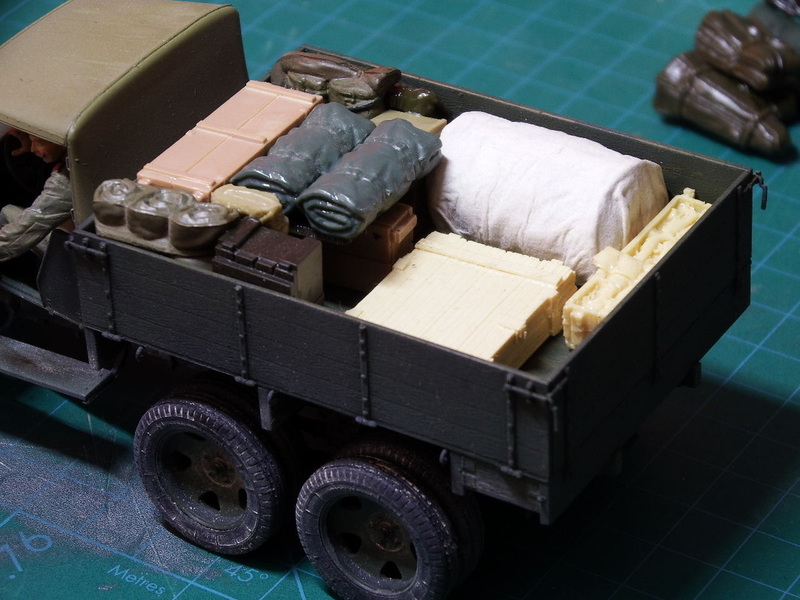 Insert Sergei (the driver figure) and install the Cargo Deck. 27. View from the other side and it all looks pretty good. 28. 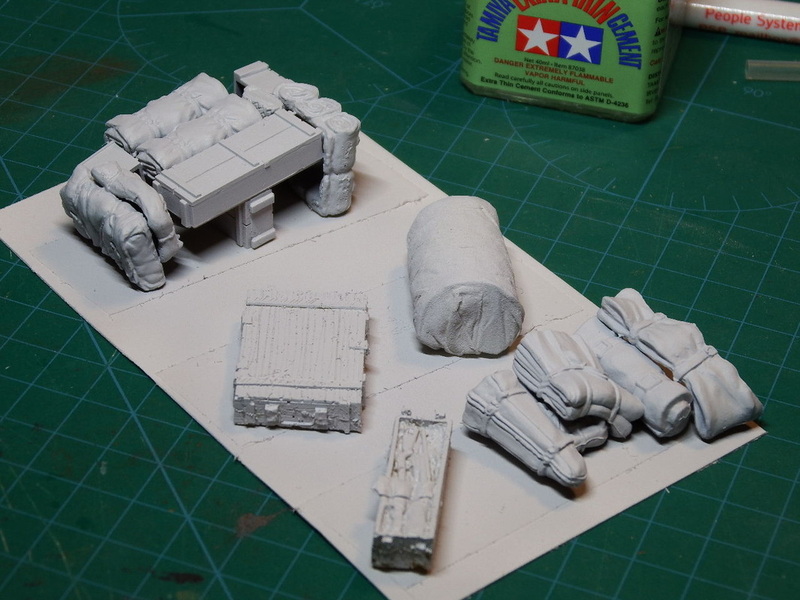 Vallejo Black Surface Primer covers the whole series of sub-assemblies and left for a couple of days to de-gas. 29. 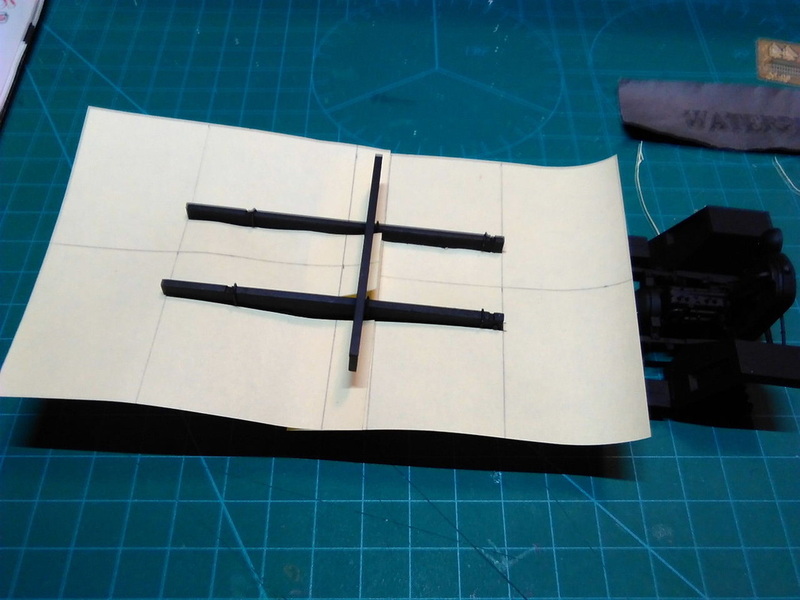 The wooden parts of the model, here the mounting beams are masked off using some creative use of a couple of post-it notes. 30. 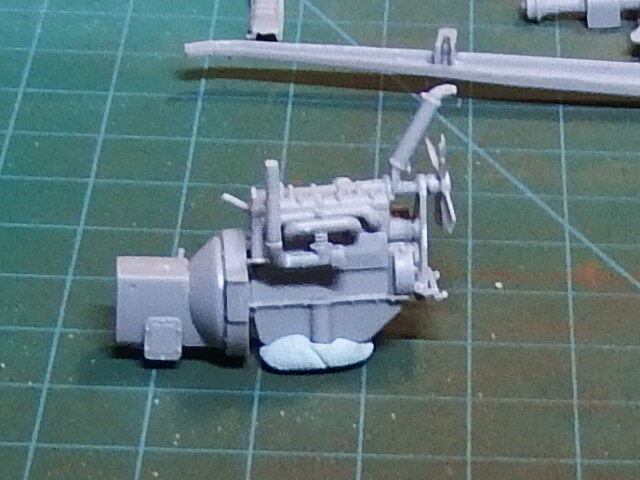 I managed to protect most of the model from overspray but some touching up will be required. 31. 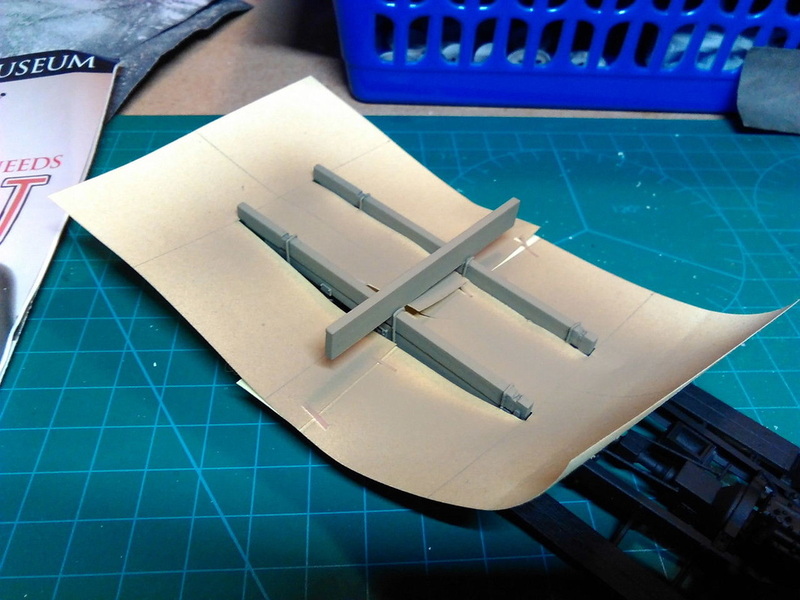 Using KIP, FineLine-tape from Germany, I cut strips and masked off the metal fittings on the Cargo Deck before spraying. 32. 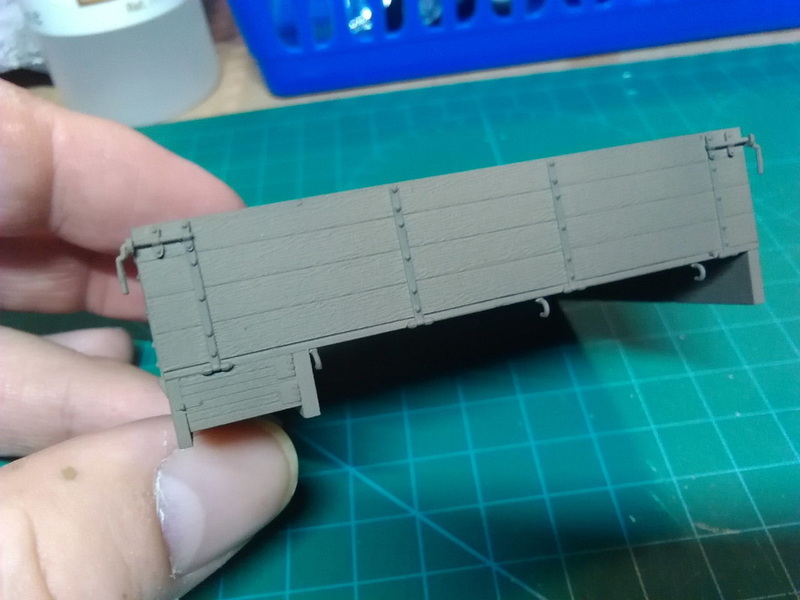 Not the best picture but, using Vallejo Panzer Aces Weathered Wood and some Thinner, I sprayed the Deck then removed the masking tapes. 33. 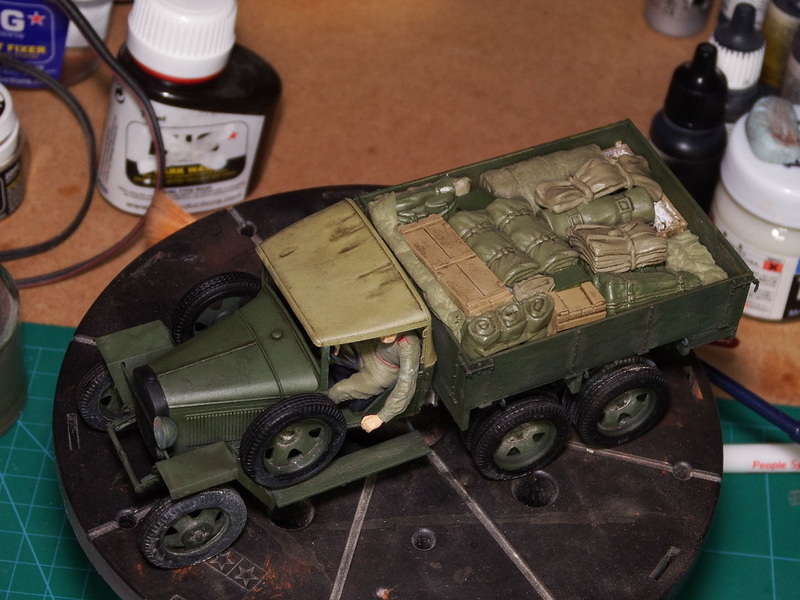 I made sure that the coverage wasn't too thick as this is not a top coat - still needs a Russian Green coating. Some of this will be worn away later to reveal the wooden deck. 35. 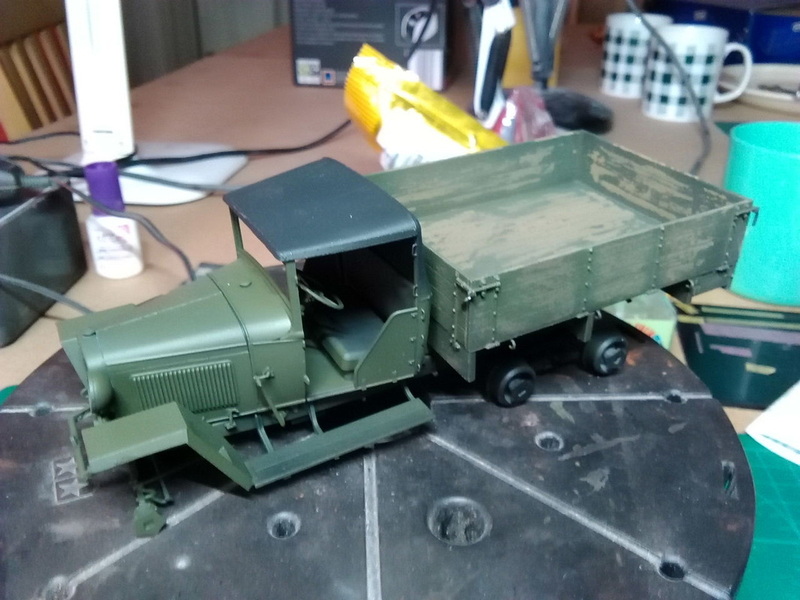 The basic Russian Green 4B0 sprayed over a Hairspray coating. 36. 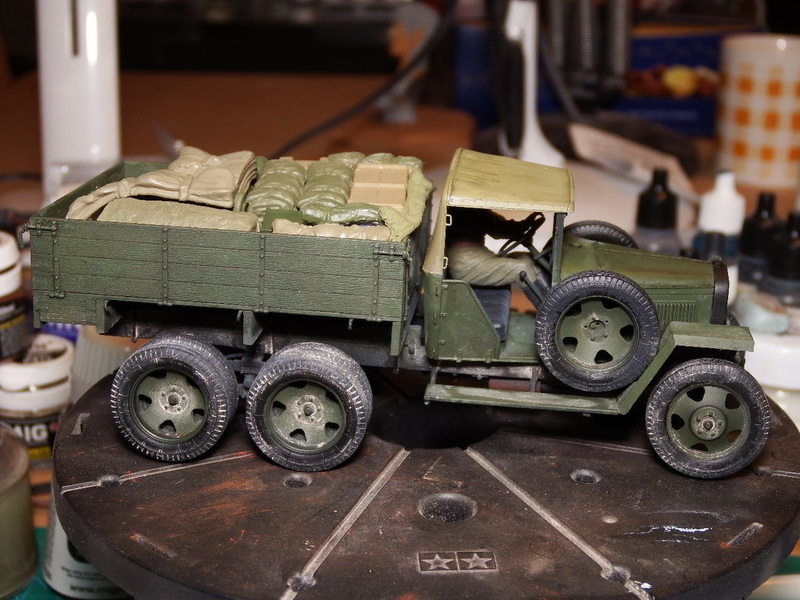 So, I scrubbed away the green to reveal the wood - I think I've overdone it a bit. 37. This needs to be corrected - as this worn look is way too much. 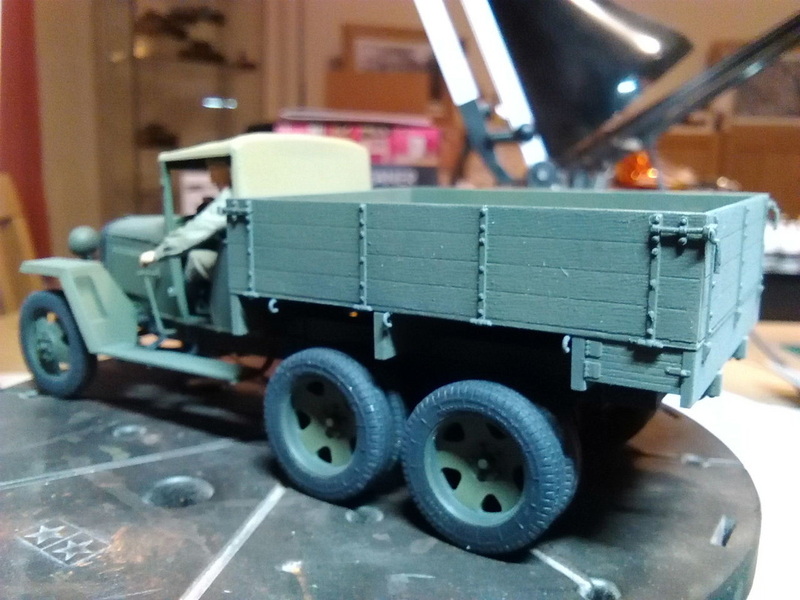 When it all boils down to it, I'm building a truck! And to be honest, they're generally pretty utilitarian and bland. 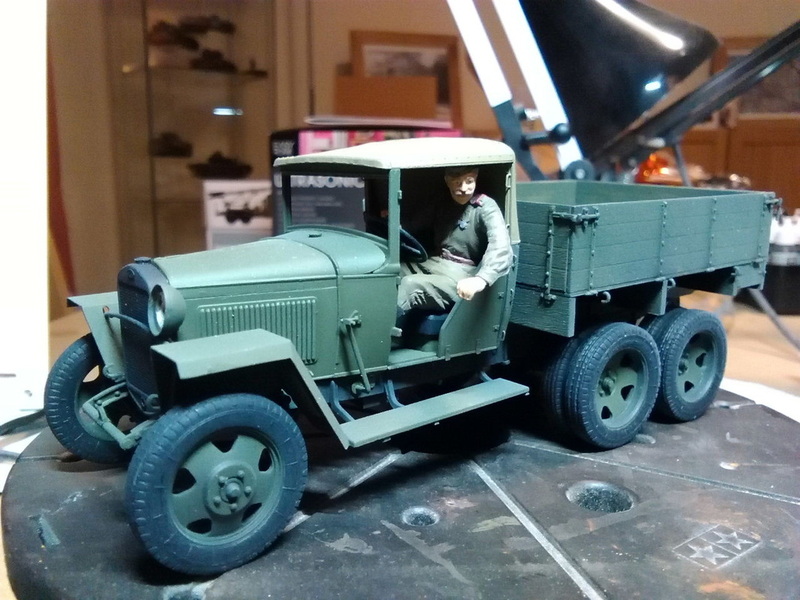 he came in the box with this kit (and 5 more of his friends) and he will be made ready as the driver. 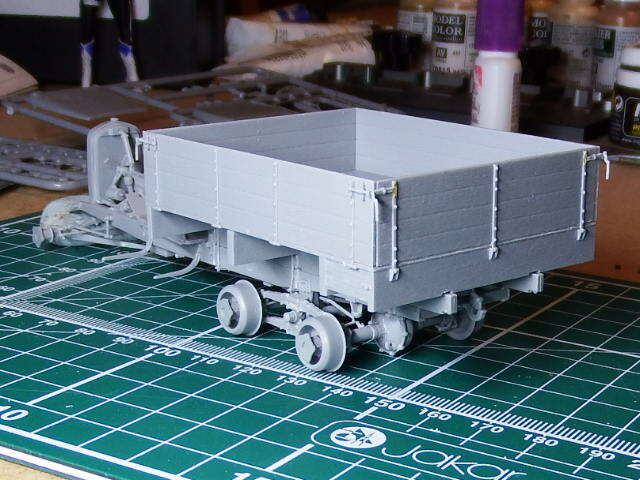 The figure actually does not fit the model and needed to be 'fettled' a bit. His clothing around the rear of the hips and bottom needed to be reduced noticeably. This continued until he fit into the cab. 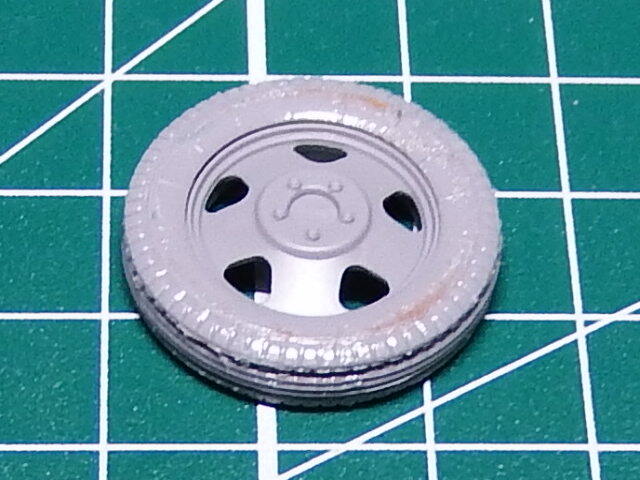 The field cap was also sanded down at the top as it was too high for the canopy. 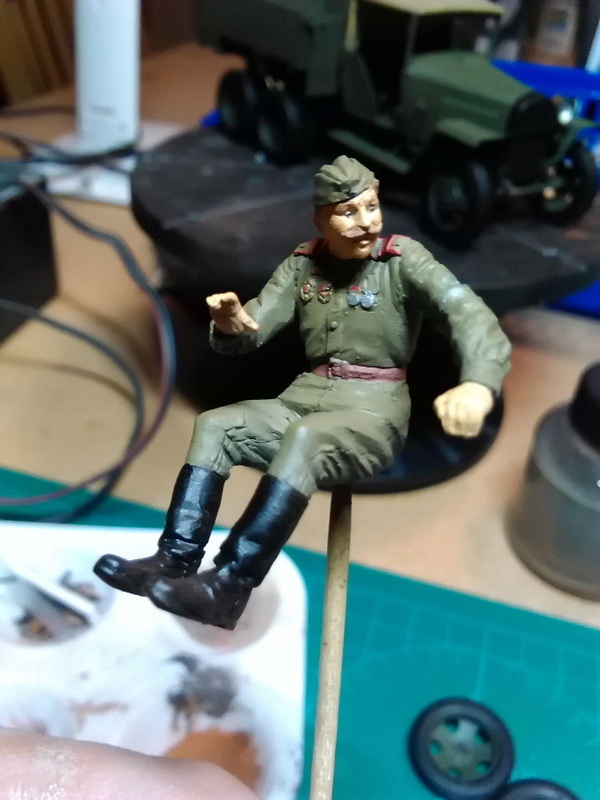 I painted him in Vallejo Russian Uniform and used flesh tones for his face and hands. 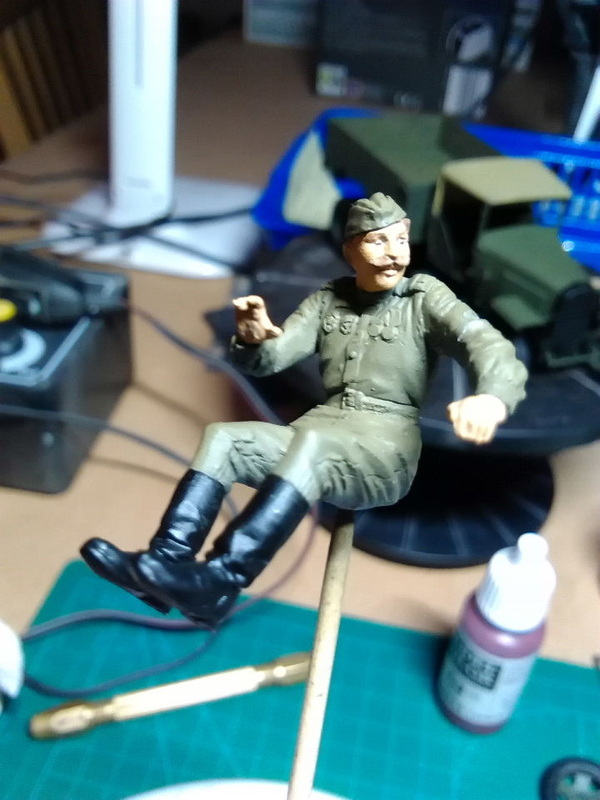 I think he looks OK, but I'm still learning about figure painting. 41. Well Sergei, you have your medals on. 42. 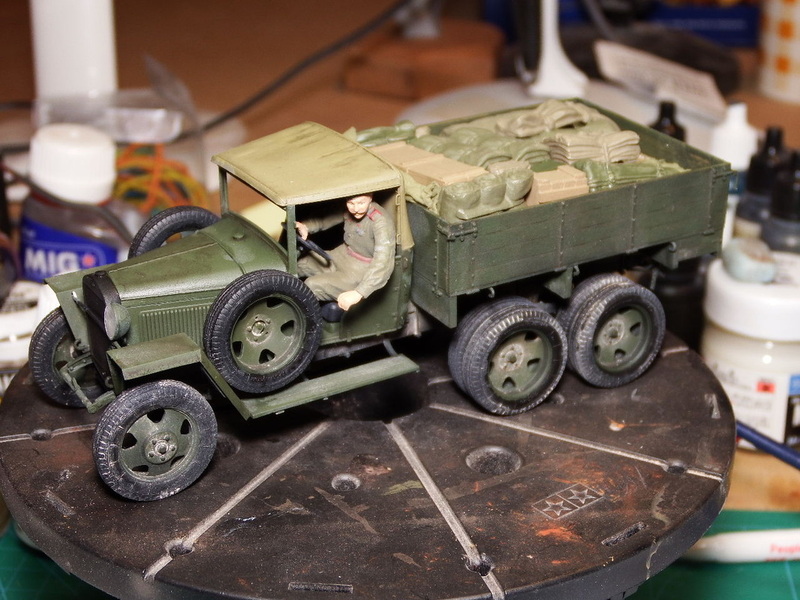 With Sergei comfortable in his truck it's time to get on and complete the final assembly. 43. 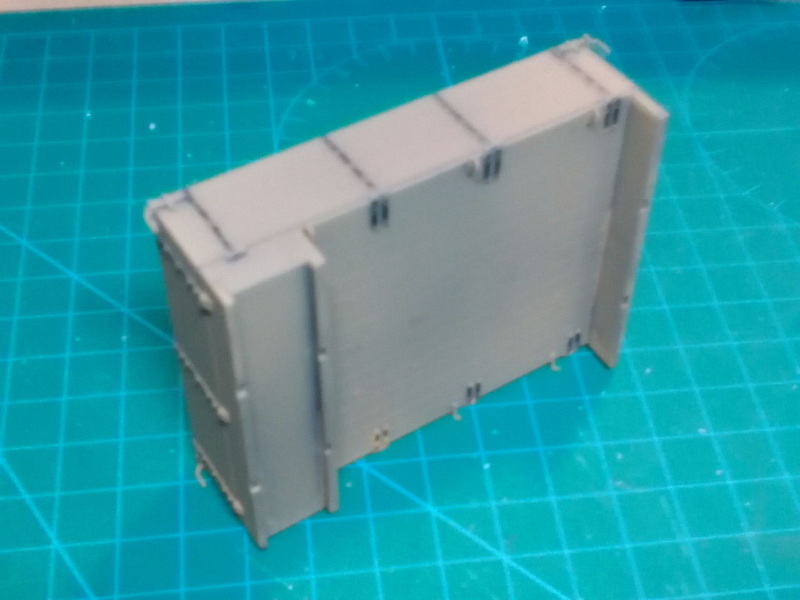 The cab has now been permanently glued to the chassis and everything is true and square. 44. 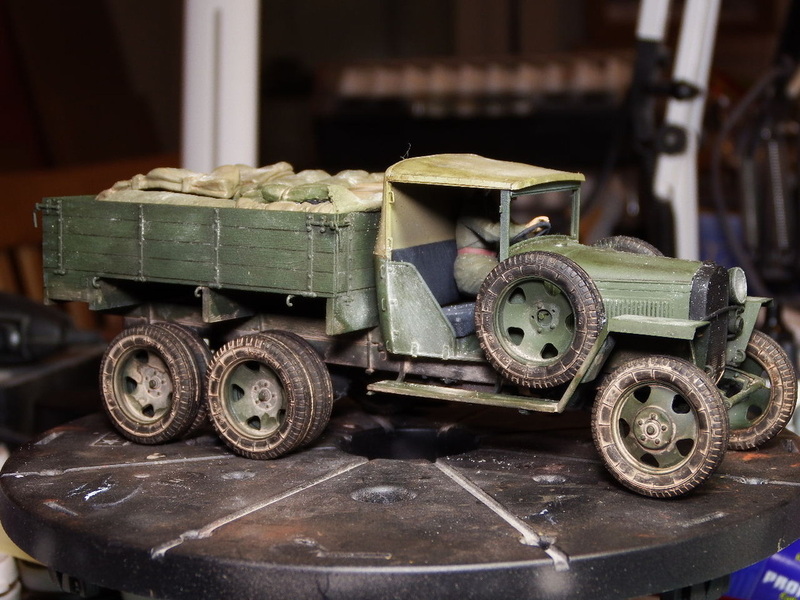 First stage weathering using a variety of MiG powders fixed onto the vehicle. 45. The powders comprised Light Dust (P027), Europe Dust (P028), Industrial City Dust (P039), Dry Mud (P232) & Light European Earth (P415) and Pigment Fixer of course. 46. The consistency and level of finish is completely down to you. I can't say how much of which one I used as I really don't know. But, I did use some of all of the powders. 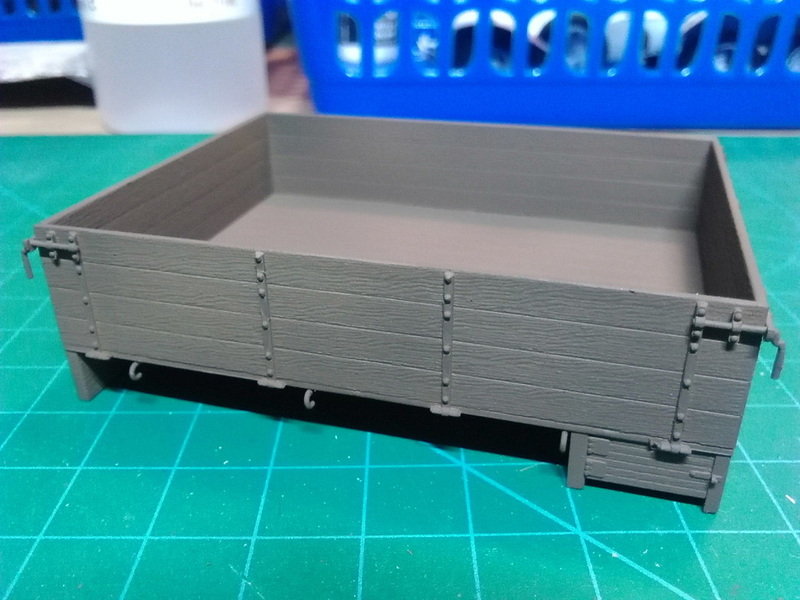 Now then, as this is a truck, it needs to have a load, so after some thought of what would constitute a 'load' and looking at pictures on the Build site on Facebook and the Internet I decided to raid the spares box. 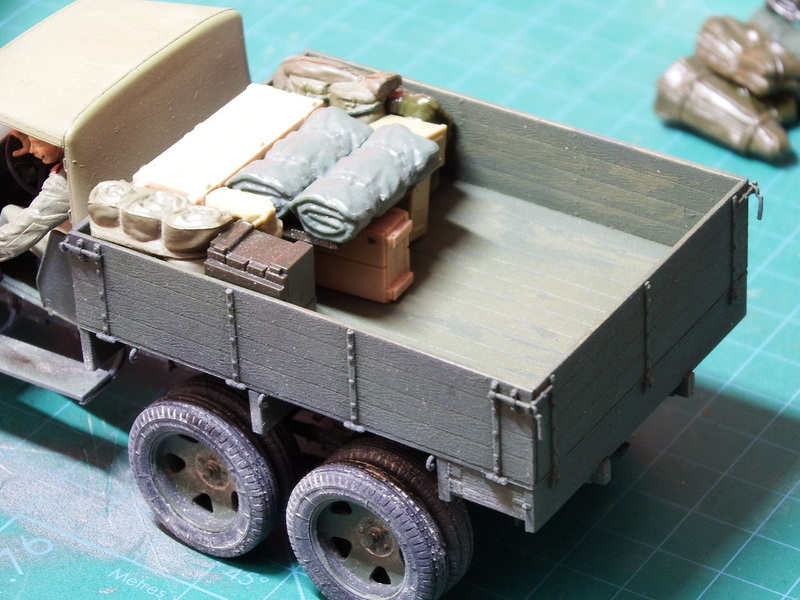 The load would be comprised of all those crappy baggage and stowage items that we get with some of our 'older' kits that have no reason for being or actual purpose - they're just BAD! 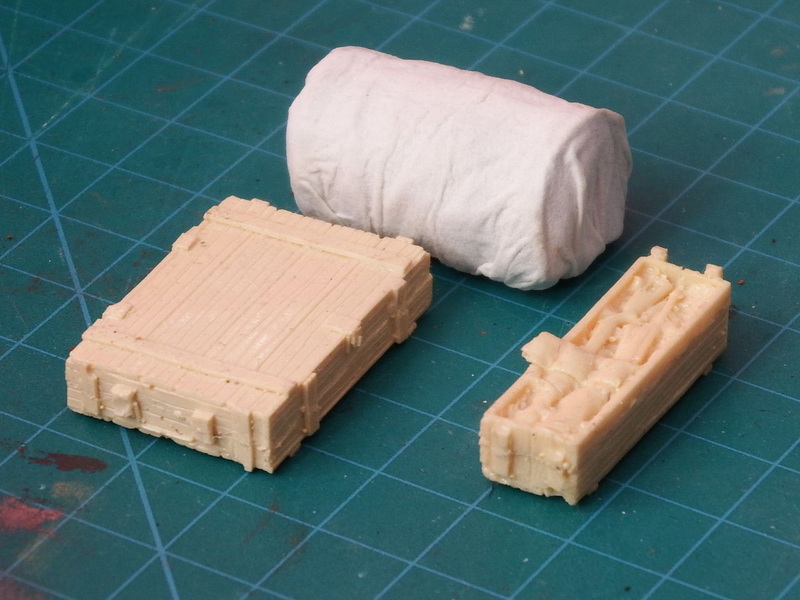 However as a modeller you can't just 'throw the bits away', I'm sure I'll find a use for them someday. Well, that's today! 47. 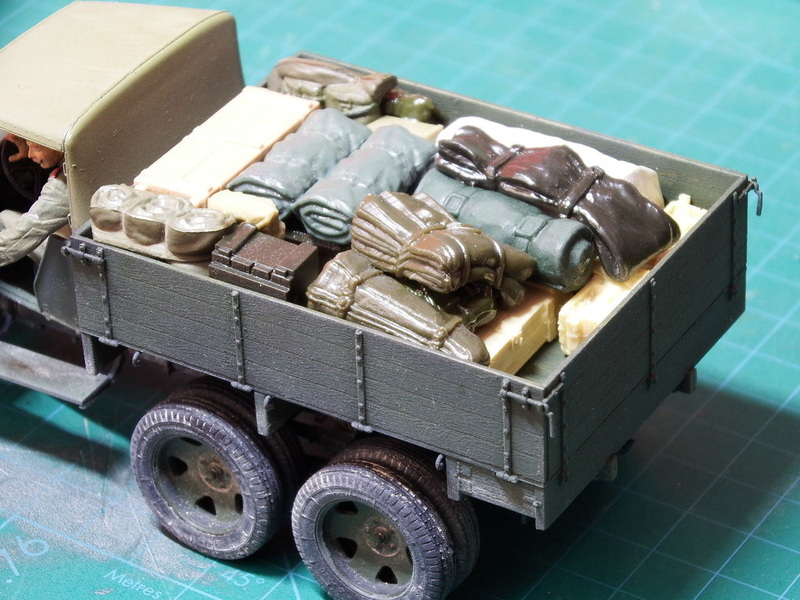 Main load - I assembled a variety of 'suitable' parts which could pass for a Russian truck load and then played around fitting the parts into the truck bed and as you can see below they do look pretty awful. 49. 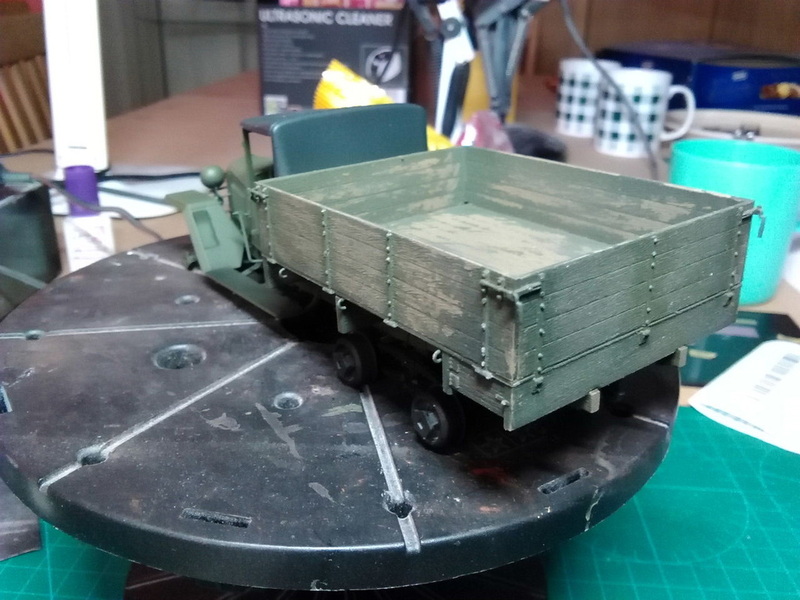 Top load - Not to worry though, as much of the load will be covered by a tarpaulin which I shall make from some Kleenex (face tissue) applied with a PVA/Water mix. 50. Phase 1 place the main load into the truck bed. 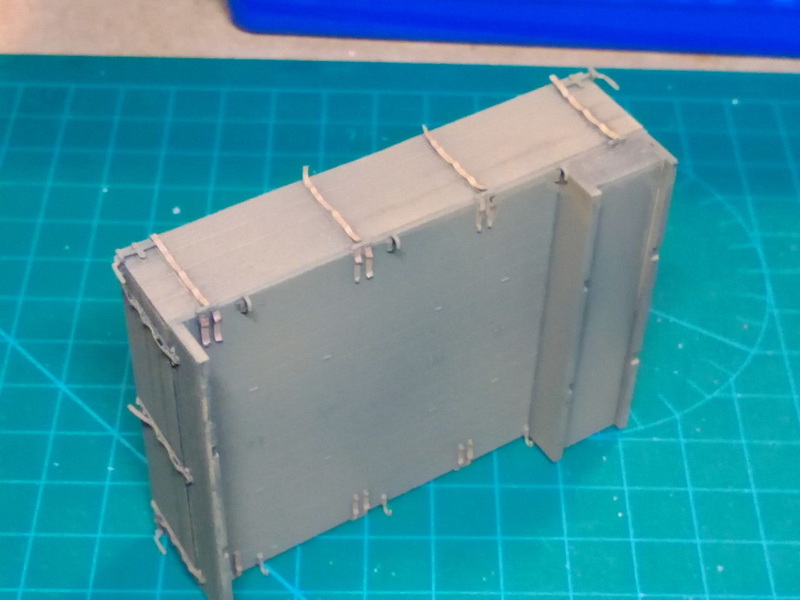 All the parts were test fitted first and then glued together. 51. Phase 2 add the loose load and adjust it to fit. 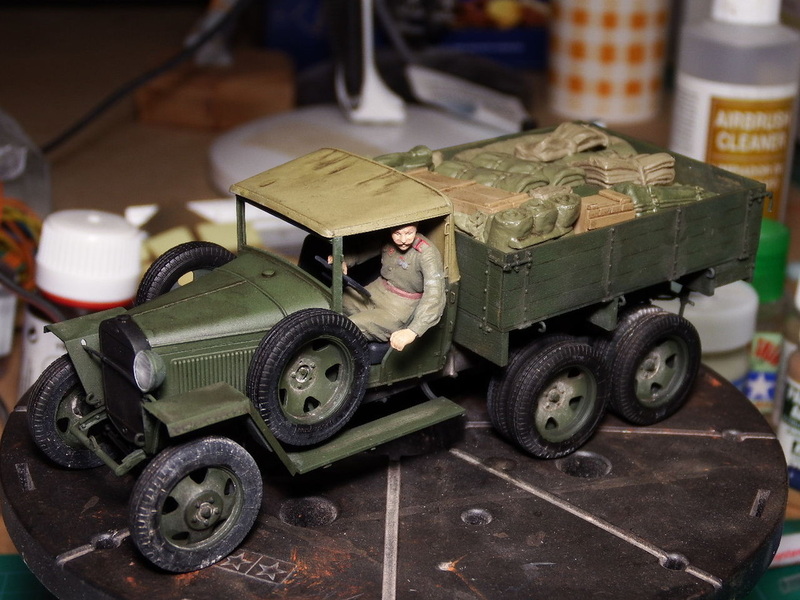 None of the load parts will be fixed to the vehicle. 52. 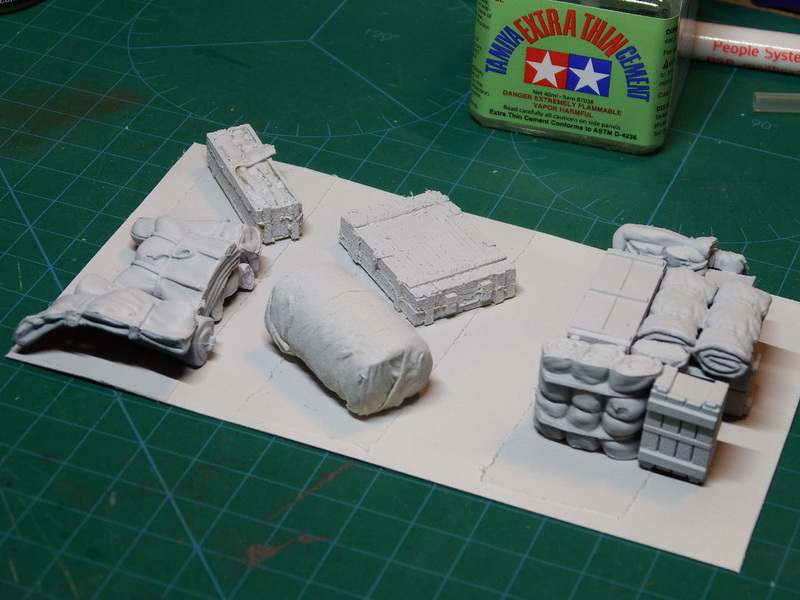 Phase 3 now that the glue has hardened I can complete the cargo with the top part of the load. Looks pretty good too! 53. The application of Vallejo Primer - Grey has certainly levelled everything. It now looks like it's resin! 54. 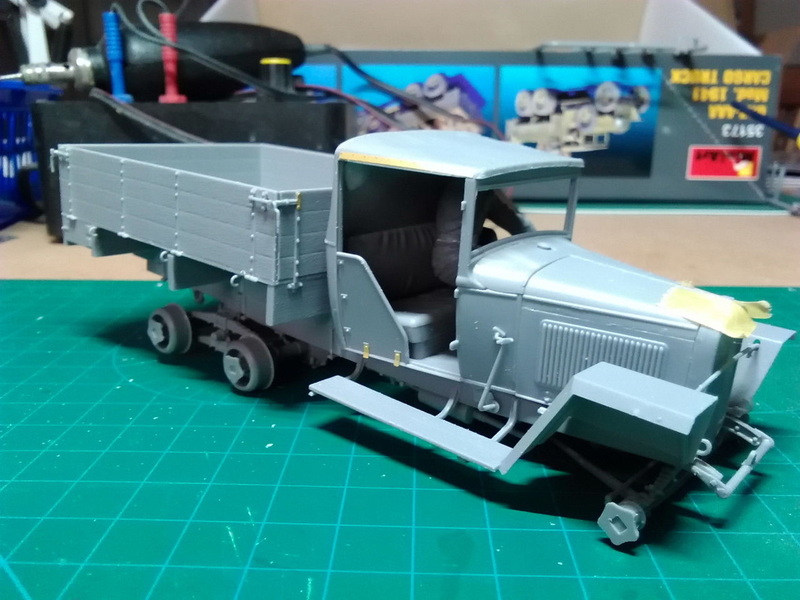 The Grey finish is just a start, as some parts will be painted further. The rest will be covered up with a tissue tarpaulin. 55. The cargo load now looks more realistic although, as you can see, the picture has highlighted some areas of concern. 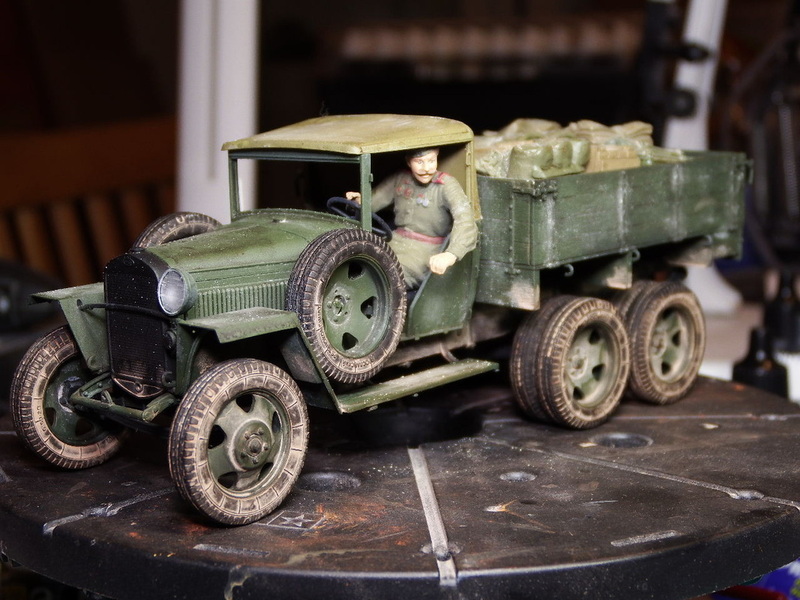 From the Vallejo range of Acrylics - Weathered Wood, New Wood, Russian Green (4B0), Russian Uniform, Canvas. Additionally, some of the colours were 'blended' to provide some added variety and contrast. 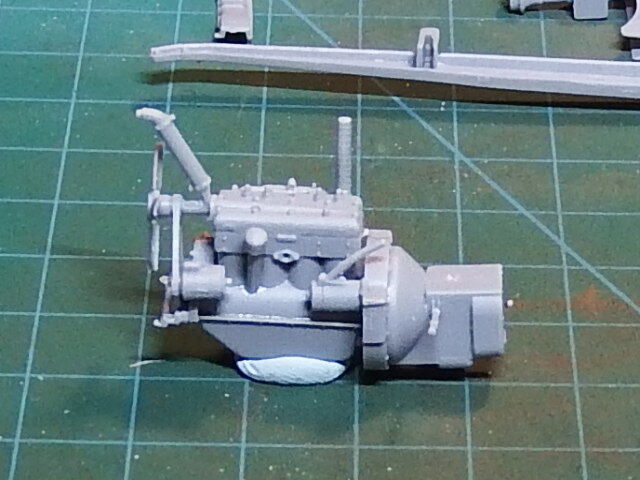 There are still a few aspects to rectify but this part of the build is almost complete. 56. 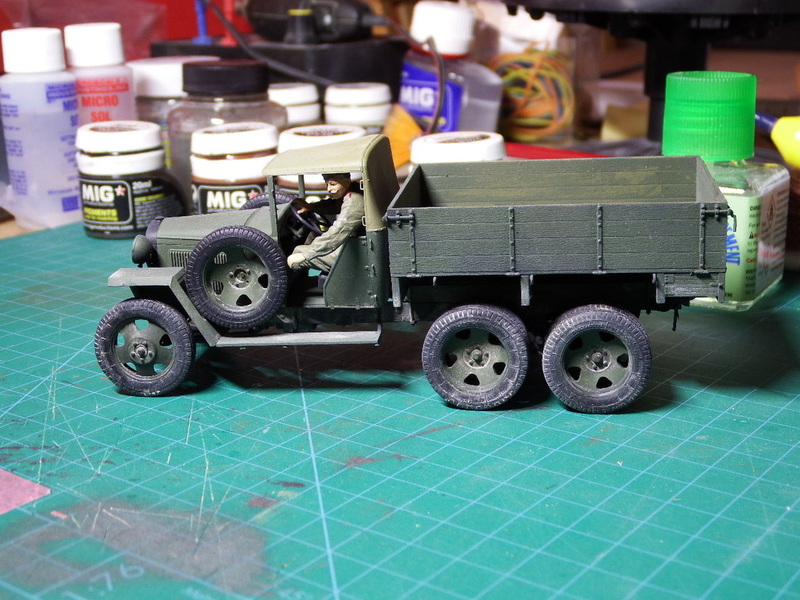 I've now applied a MiG Dark Wash just to the vehicle and although still wet the difference is noticeable. 57. 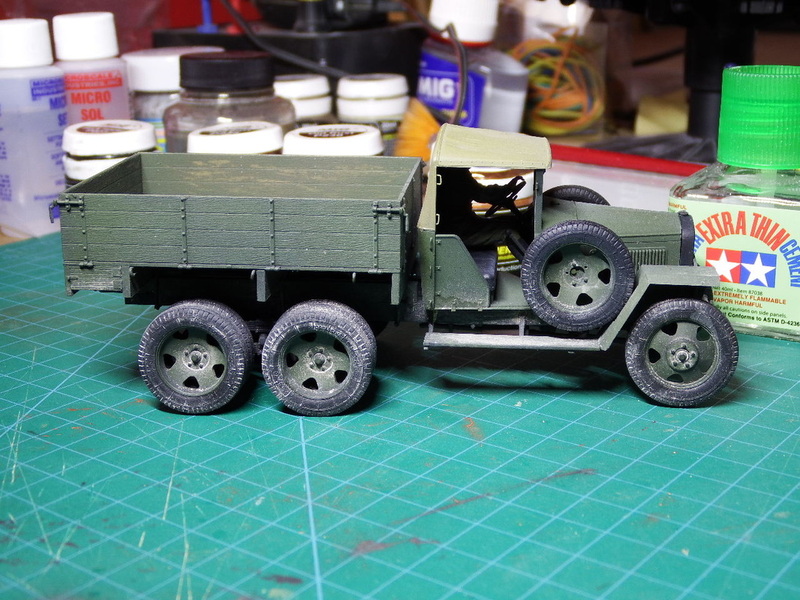 A slightly better view of the washes effect on the vehicle as you can see all the panels and woodgrain. 58. 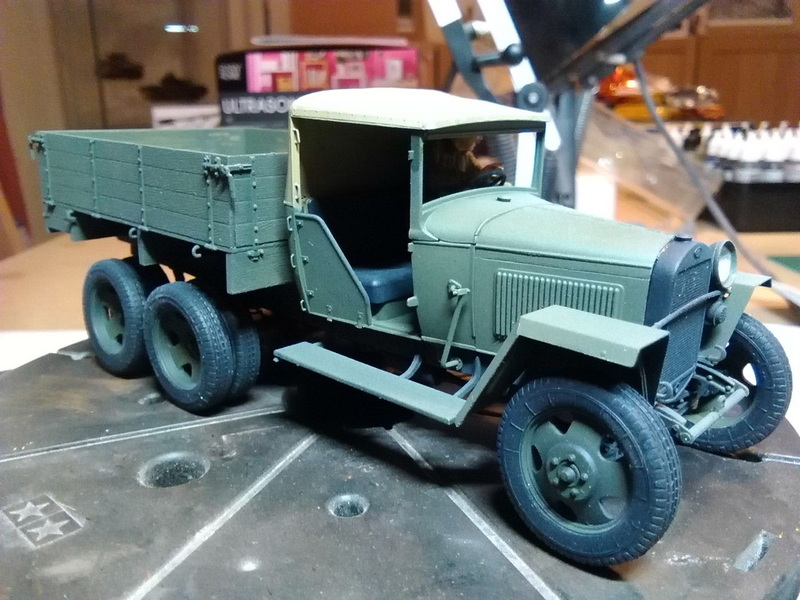 With a 2nd wash on the vehicle the depth of finish is complete. 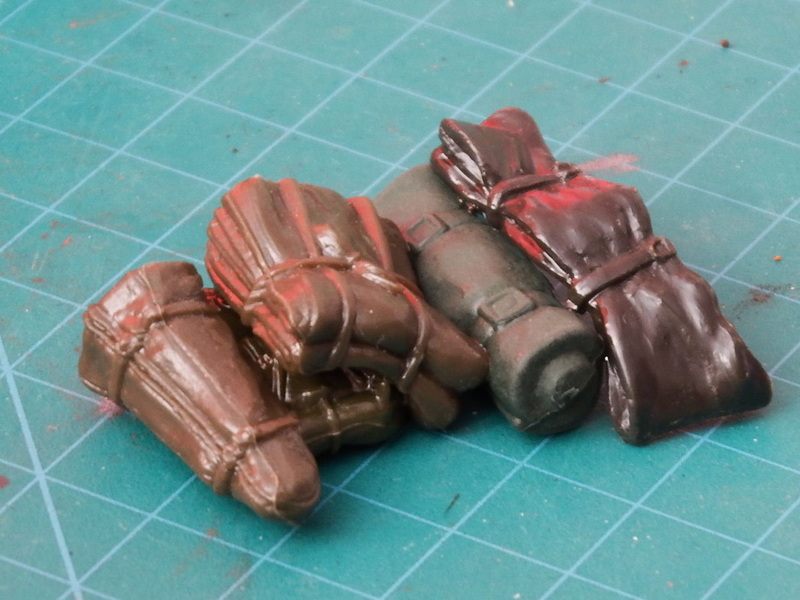 Soft weathering comes next. 59. 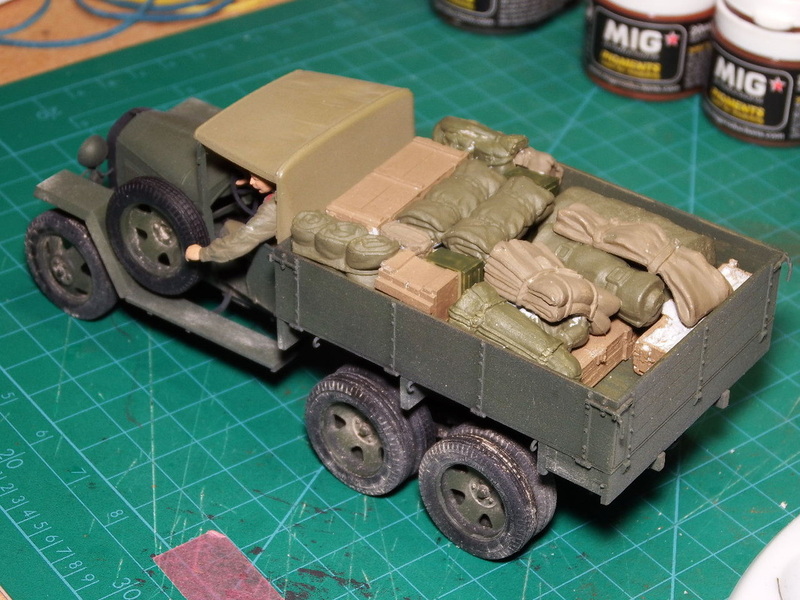 I also did the 1st wash on the cargo load after I'd made some new Tarpaulin's to remedy a few gaps in the load. 60. 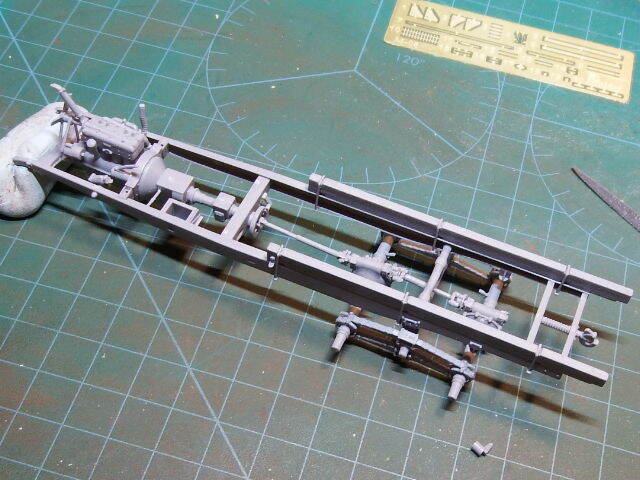 The underside is a bit bereft of weathering as for the most part, none of it will be seen. 61. 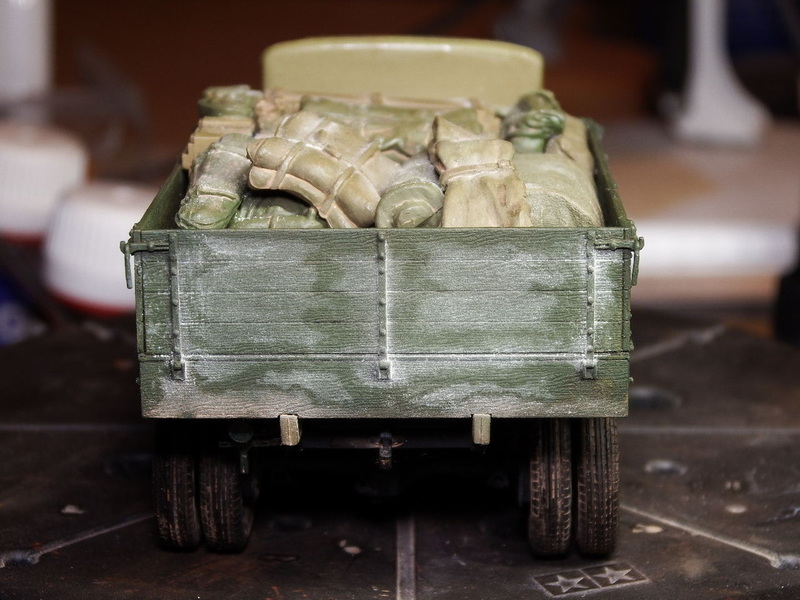 A close-up of the forward section of the vehicle to express the detail involved. 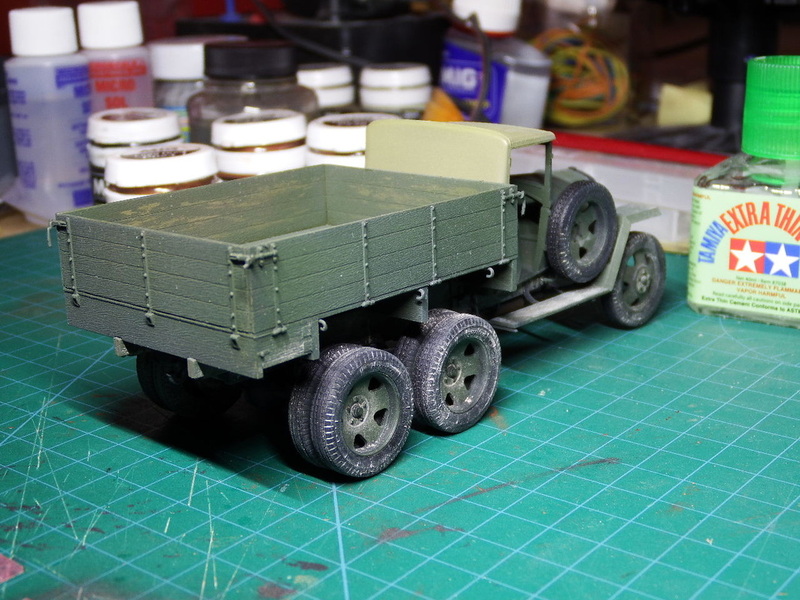 Further weathering will occur should the vehicle be mounted onto a base. 62. 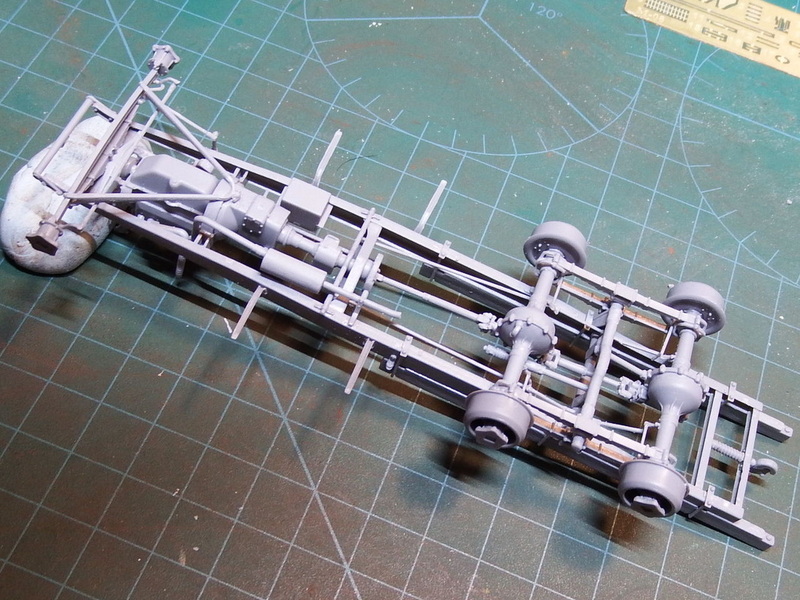 Likewise, the rear chassis which was an 'interesting' part of the build. Most is unseen once the vehicle is upright. 63. Probably, for me, the most frustrating part of this build is the locating of the rear reflector/convoy light. This just will not stay glued! 64. 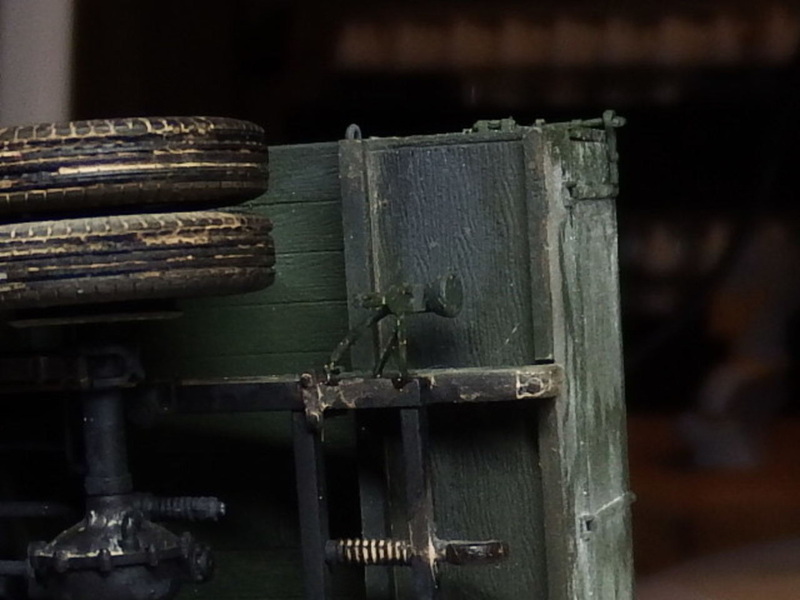 With the MiG Dark Wash and latterly a Powder mix wash there is enough detail to express the context for the model. 65. 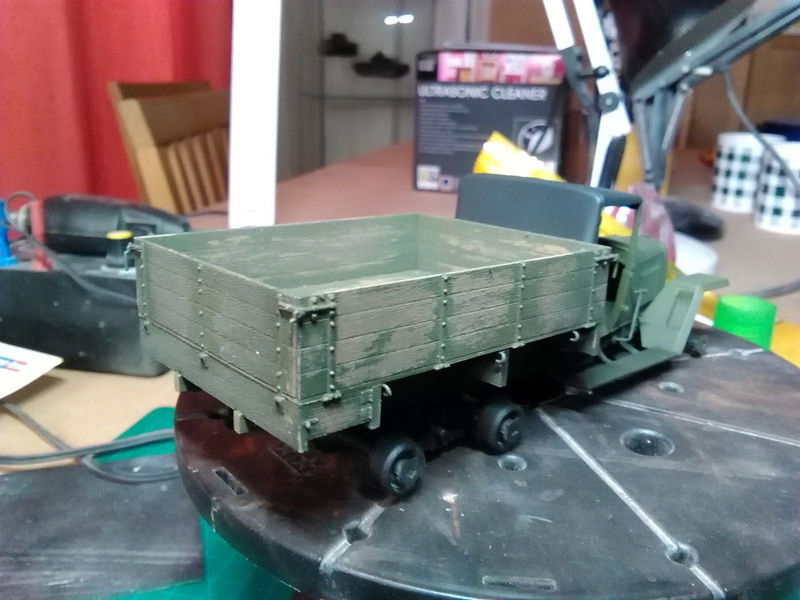 The final layer of light dust has dulled the harsh brown of the MiG washes slightly and this helps to make the vehicle look a bit more realistic.